of a multi-disciplined international team with expertise in a variety of areas such as: network architecture & installations, data security, database development, e-commerce development, website design and development, visual identity design, IT training, software development and much more. 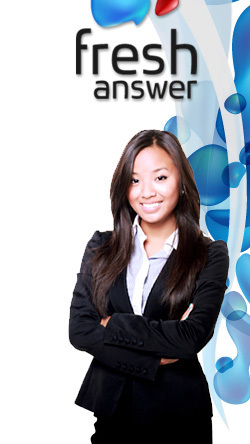 freshanswer is an authorized Microsoft certified partner. We provide the skills and experience necessary to deliver high quality, cost effective solutions. Our clients are assured that they are supported by some of the most qualified Microsoft programmers available today. freshanswer's strategic partnership with Microsoft helps the programmers always be up-to-date on the most current releases of Microsoft products and technology. Combining Microsoft's solution framework (best practices methodology for planning enterprise solutions) with Rapid Application Development Methodology, we can quickly build cost effective business solutions around Microsoft's Distributed Network Architecture. freshanswer designed and developed "Jewel Office", an outstanding comprehensive management software solution for the jewelry industry. Jewel Office is sold exclusively by freshanswer. freshanswer's cross-functional teams are sectioned into three primary areas of services: Customer Experience Innovation (The Design Center), Asset Services Innovation (The IT Center), and Customer Experience Operations (The Web Support Center). Our team delivers expert solutions, the highest level of service, an innovative approach, and all at competitive prices.